151 WATER changed my life! 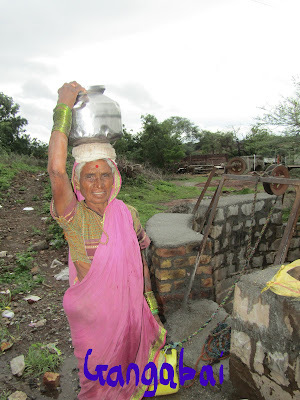 Ahmednagar (Maharashtra), October 2017: Gangabai Akolkar (55 years) a resident of Marathwadi village (Ahmednagar) is much relieved today, thanks to the water project that brings water to her village. Three months ago she had to walk for 2.5 kilometres to fetch water for her family. The “Water Project” was implemented by Bosco Gramin Vikas Kendra (BGVK) and supported by Salesian Missions, USA. Successive years of scanty rainfall in the villages of Marathwadi and Kolhewadi in Ahmednagar and Beed districts had made the life of villagers miserable and helpless. Lack of water had changed the natural landscape of the villages. Agricultural productivity was going down, cattle were not producing enough milk, ground water table was declining, people were migrating, and children were suffering. This was how these villages were described, until BGVK intervened with its ‘Water for All’ project. For improving water security and water management, BGVK focussed on facilitating groundwater recharge and retention of water to improve soil moisture, de-silting of canal-bed, increase the green cover, laying a pipeline to the village. Along with pipeline BGVK completed excavation of 2 check dams for de-silting, recharging of village wells and also constructed 2 drinking water tanks of each 10,000 litre capacity. The local villagers provided the technical support and manual labour, the financial support was given by Salesian Missions. Fr Rolvin D’Mello (Executive Director – Don Bosco Development Society) during the inaugural speech said “Water for drinking and irrigation is lifeline of people in villages. This project is our small effort to help people improve health and income and thus lead a better quality of life”. This project has benefited 1200 people in two villages and saves at least 1000 man hours daily, which is now used more productively; and has also made the life of girl children and women more comfortable in villages as they have the primary responsibility of fetching water for the family.